As I said in my earlier post, Varanasi was one of my favourite places visited on this trip. It's really interesting to visit a place that is so important, so revered, by local people. Visiting as an outsider, you remain respectful of their view, of their beliefs, but you can never understand or experience the place in the same way that they would. It's an important part of travelling however, to understand that we all have different places, or traditions, that might seem strange or unusual to an outsider but that make complete sense to us. These quirks are what make humans interesting, unique and diverse and these are things we should not just tolerate but embrace and they are worth fighting for. 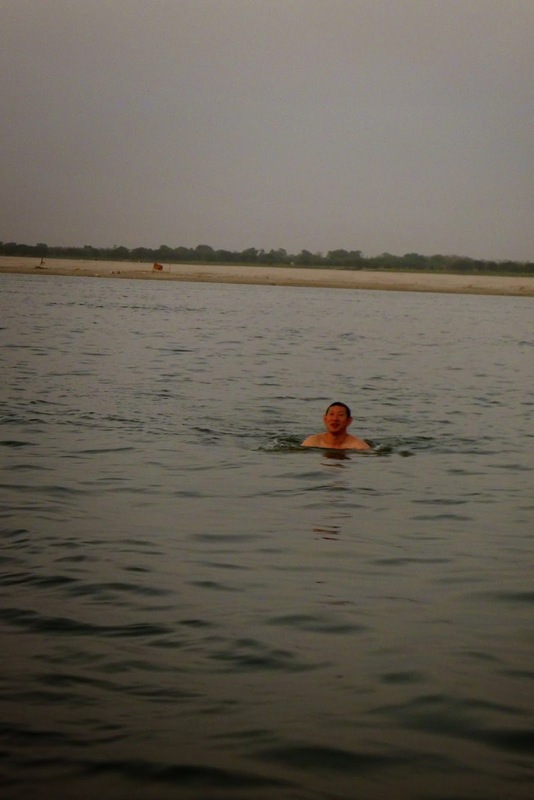 During our sunset boat trip, we watched a guy swim right past our boat, bathing away his sins, cleansing his soul in the holy Ganges. We watched cremations, dust and ash floating in the air and out into the waters, we saw people washing their clothes in the river. All life (and death) flows through this river. We participated in our own small candle ceremony, lighting a candle in remembrance of our lost loved ones, placing it onto the water to float away with our good wishes and love for them in the afterlife. We drifted down past all the ghats and temples, with ceremonal fires burning. We sailed past a cremation (there are no pictures as a mark of respect). We watched a religious ceremony with music and chanting. All whilst the sun set behind us, over the sacred Ganges.